Cemetery Point Park is a three-and-a-half-acre park located on coastal upland with 400 feet of sandy shore. Bordering a channel of the Gulf, the park provides a place to fish on the shore, swim and kayak. A fitness trail, a picnic shelter and a small play area invite visitors to spend a few hours. The 1,200 foot boardwalk, which gives access to the park, offers great views for birding and observing life in a thriving tidal marsh. The trail’s path is an easy walk (.o6 miles) beneath towering pines, beside aromatic cedars, and among dozens of varieties of native plants and wildflowers From State Road 24 southbound (approaching Cedar Key), turn onto Grove Road; a small parking area is immediately on the right at the trailhead.Native plants along the trail are identified with markers and a bit of history about each plant. The City of Cedar Key also provides for public protection along the trail. Accessible only by boat, this preserve is a favorite of anglers because it boasts both saltwater and freshwater fishing. Bordering Florida’s Gulf Coast between Cedar Key and Yankeetown, extensive salt marshes and tidal creeks create habitats for saltwater fish, crabs, and shellfish. The park’s uplands protect a remnant of the Gulf Hammock that once spanned thousands of acres between the Suwannee and Withlacoochee rivers. Endangered and threatened species-including West Indian manatees, bald eagles, American alligators, and Florida black bears-live or feed within the preserve. Although there aren’t any marked foot trails, nature enthusiasts can enjoy wildlife viewing from a canoe. There are several primitive campsites on the Preserve, accessible only by private boat and are available on a first-come-first-served basis. Boat access is from CR 40 in Yankeetown, CR 326 in Gulf Hammock, and Cedar Key. Features/Amenities – Tours, educational signage and/or nature center, Seasonal hunting, Birding by boat, Birding by foot/hiking, Birding by bicycle, Best time of day: Morning, Recommended length of visit: all day, Horseback riding, Butterfly viewing. Habitats – Freshwater Swamp, Freshwater Marsh/Wetlands, Pines, Scrub, Hardwoods/Mixed Forest, Salt Marsh. Description – The spectacular Cedar Key Scrub State Reserve is divided by CR 347 into east and west tracts. The east side has 4 miles of color-coded, multi-use trails and firebreaks available for exploration, and features flatwoods, sandhills and scrub. The latter provides habitat for the colorful Florida Scrub-Jay, the Sunshine State’s only endemic bird species. This reserve represents the northern end of its range on Florida’s Gulf Coast. Common Ground-Dove, Pileated Woodpecker, Eastern Indigo Snake, Gopher Tortoise and Florida Mouse also occur here, thanks to ongoing restoration and management activities. The west portion has 8 miles of multi-use trails and slopes down through Black Point Swamp to tidal creeks and salt marsh; listen for Clapper Rail, Marsh Wren and Seaside Sparrow. Look and listen for scrub-jays near the west entrance’s parking area, and along CR 347 and the Orange Trail. Lower Suwannee National Wildlife Refuge, established in 1979, is located along the southern edge of the Big Bend region of Florida’s west coast, approximately 50 miles southwest of Gainesville. This 54,000 acre refuge is one of the largest undeveloped river delta – estuarine systems in the United States and was established to protect natural ecosystems of the Suwannee River’s lower reaches and coastal marsh, as it empties into the Gulf of Mexico. This diverse mixture of uplands, freshwater, saltwater and their associated wetlands, creates a great variety of wildlife habitat and scenic vistas. Osprey and bald eagle nest in early spring, while graceful swallow-tailed kites arrive in March for breeding and remain through July. In March and April migrating shorebirds cover the oyster bars; thousands of knots, dowitchers, oystercatchers, sandpipers, turnstones, and plovers fatten up for their northward trip to their breeding grounds. Wading birds are most abundant during the summer and they can be found feeding in the freshwater and salt marshes. White ibis, great, snowy, and cattle egrets along with great blue, little blue, green, and tricolored herons are among the birds that roost and nest on nearby Cedar Keys refuge. Rare Limpkins and endangered wood storks are occasionally seen prowling the water’s edge during the warm months. The Shell Mound Unit of Lower Suwannee National Wildlife Refuge is adjacent to Cedar Keys National Wildlife Refuge. This unique feature was created by archaic period Eastern Woodland Indian cultures by discarding oyster and clam shells they used as a food source. The area was inhabited by this culture for at least 1,000 years from about 450 to 1,800 years ago. Once used as a source of materials for road construction (prior to Refuge ownership) the mound is now protected from all but foot traffic, attracting about 60,000 visitors per year, yet it never seems like anyone else is there. This is a sea kayaker’s playground, a shallow ocean area often only inches deep over hidden oyster bars, located among barrier islands and thick with wildlife. For inexperienced sea kayakers, these serene waters are a safe, accessible place to get comfortable with ocean kayaking without the interference of constant motor boat traffic. Experienced kayakers will love the area for its tranquil beauty or as a jump off point for greater adventures, such as paddling five miles up the coast to the Suwannee River, or wilderness camping on Clark Island, just an hour paddle north of Shell Mound. Located off Highway 347, adjacent to Headquarters drive, the trail is a short, shaded 3/10 of a mile to the historic Suwannee River. You will travel past Prothonotary warbler boxes, a bat house/wooden duck condo, and a shaded bench, before you reach the observation deck over the river. There are approximately 60,000 bats that reside in our bat houses. Get there about 45 minutes before sunset to see them. The adjacent Bottomlands boardwalk runs 1000 feet across a cypress swamp (maybe in drought season), and back to the parking area. Barred owls, Pileated and red-bellied woodpeckers have been seen. Located adjacent to Shell Mound, it has its own parking area. The One mile loop trail crosses Three bridges over the salt barren and takes you through a dense population of sweet smelling Carphepherous (Vanilla Plant). Shaded benches are located near the freshwater pond and the creek, so you can watch the birds watching the fish jump. Located off Highway 357, at the Shired boat ramp parking area. Follow the trail to the “Beach” that was constructed 7,000 years ago by ancient Coastal cultures. From the shoreline, the shell midden is evident as you look back to the tree line. This is one of the finer beaches for picnicking and photography in the area. Unless an area is posted as CLOSED or NO ADMITTANCE, you are WELCOME TO HIKE OR BIKE BEHIND ANY LOCKED GATES. 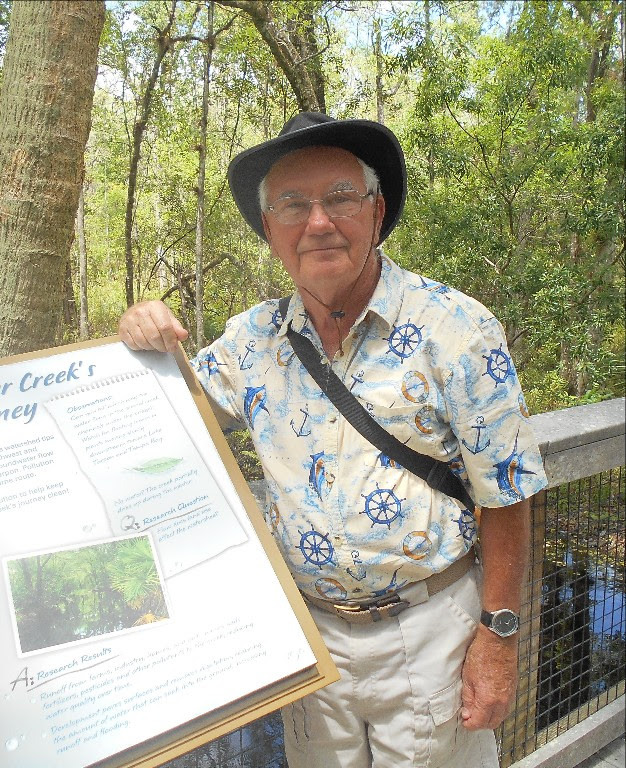 Brian Smith at the Brooker Creek Preserve in Pinellas County. Chairman, Florida Greenways & Trails CouncilWe love trails. Short trails, long trails, trails that wind through forests, and trails that take you straight through a vibrant city. The Coast to Coast Connector trail has it all: 250 continuous miles of natural landscapes, urban environments, and unique experiences between the Canaveral National Seashore and the Gulf of Mexico. 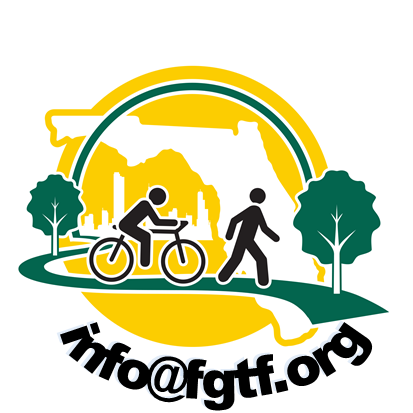 The best part is that the C2C is just the beginning.The Florida Greenways and Trails Foundation is championing regional, multi-use trails all over the state. We’re talking about connecting Jacksonville to Miami, Miami to Key West, and Naples to Tampa. 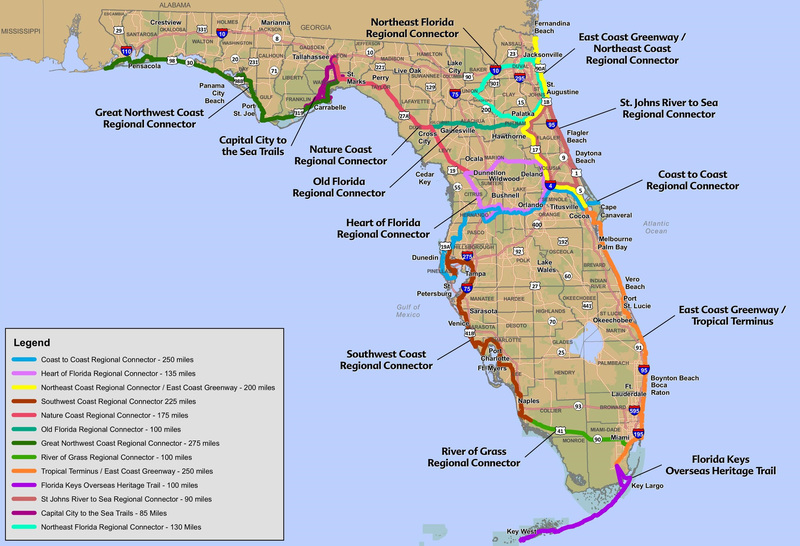 The East Coast Greenway,Florida Keys Overseas Heritage Trail and the Southwest Coastal Regional Trail are just a few of the long-distance, paved trails coming to life around the Sunshine State. This means the future of Florida transportation will include thousands of miles of opportunity to travel safely between destinations without a plane, train, or automobile. Railroad historians can tread the path of the old Fernandina to Cedar Key rail line, and look across the marsh to where the line once connected with the main shipping dock. Some of the old trestle posts are still visible at the water’s edge.